Get the print edition and support a refreshing vision of humanity. 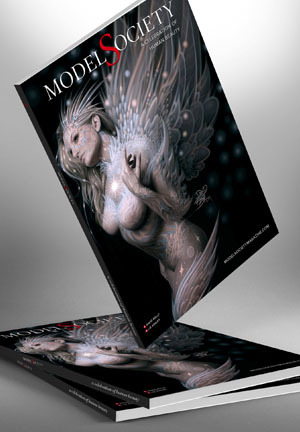 This issue is of Model Society Magazine is dedicated to artists who offer us an expanded vision of our own humanity. They have traveled the realms of the subconscious and the imagination to create images we would otherwise never see. They offer us images of humanity across a spectrum of potential. Through good and evil, light and dark, they use metaphor and fantasy to reveal truths and insights that more literal or realistic images cannot. Models provide inspiration, while artists supply vision and skill, but we need you to complete the picture. As the viewer, your experience is the final destination for these images. Through these great works of art, we hope you will be inspired to see yourself and others in new and refreshing ways. Thank you for supporting the celebration of human beauty as art. Enjoy Model Society Magazine and support a refreshing vision of humanity. See the human form through the eyes of top visionary artists as they create fantastic, surreal and inspiring images.